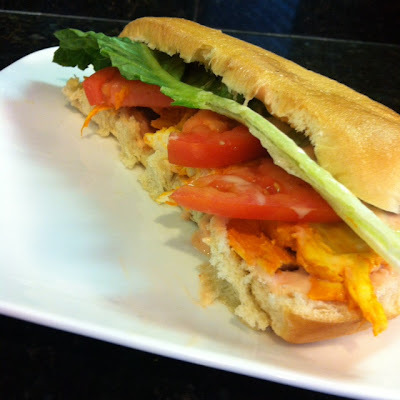 The other night I had this craving for buffalo sauce, wings came to mind, but I knew they would be far too high in calories so I decided to make a sandwich instead with baked chicken. The chicken baked for 30 min at 350. It came out moist and delicious. The kids even ate it as the spice was not too bad at all. I found some sub rolls at Walmart, they were slightly high in calories so I once again used my hollow out trick and was able to remove 1/4 of the calories and still left the outside of the roll in tact and perfect. To make my meal more spicy I added a few dashs of Frank's Red Hot Sauce to my fat free ranch dressing. The sandwich was a hit and we will for sure be making it again we served ours with corn on the cob and some baked potato chips.